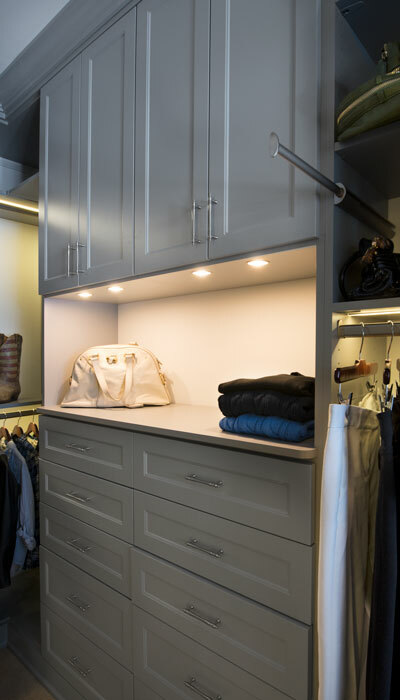 Closet Works transformed this space that was previously as dark as a cave into this brightly lit focal point of the home. 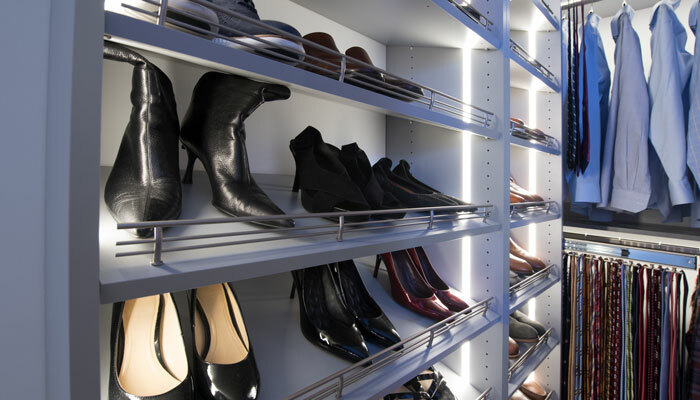 We developed an excellent, manageable, and maintainable lighting plan using LED strip lighting to illuminate not only the hanging area, but also the shelves and work spaces. 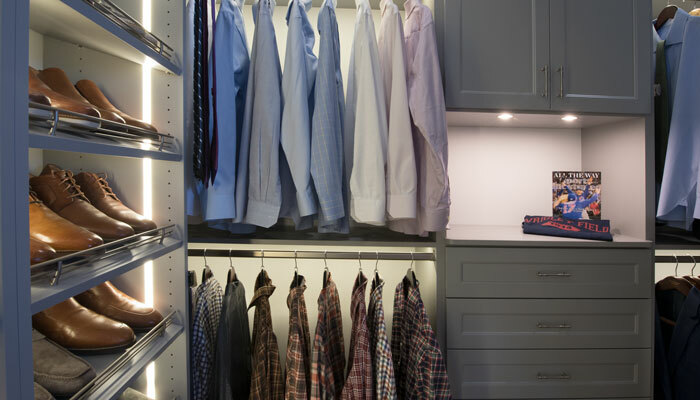 Organizational spaces for more than just clothing were an important priority in this closet design. The clients, who travel frequently, wanted to make sure they had a space that could be used for a packing a suitcase. An area for staging important papers that must not be forgotten when leaving for the office, as well as other work priorities, was also desired. 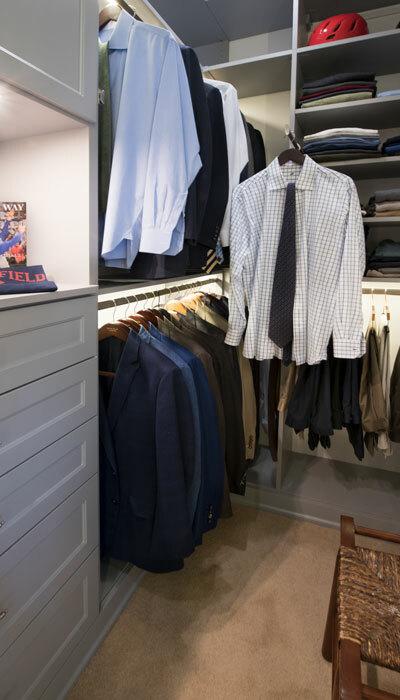 The final master closet design is divided into two sections, essentially two master walk-in closets — one for him and one for her. The more traditional solution would have been a single open closet with a large island running down the middle, but by having a penninsula that functions as a wall, we were able to increase the amount of hanging space and the number of shelves. 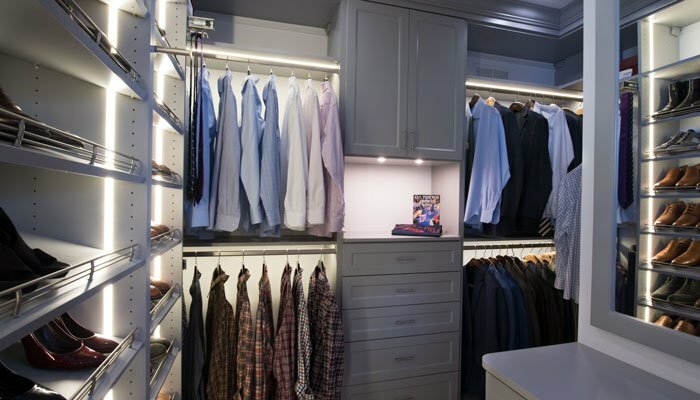 Both sides of the closet feature an elaborate LED closet lighting system. 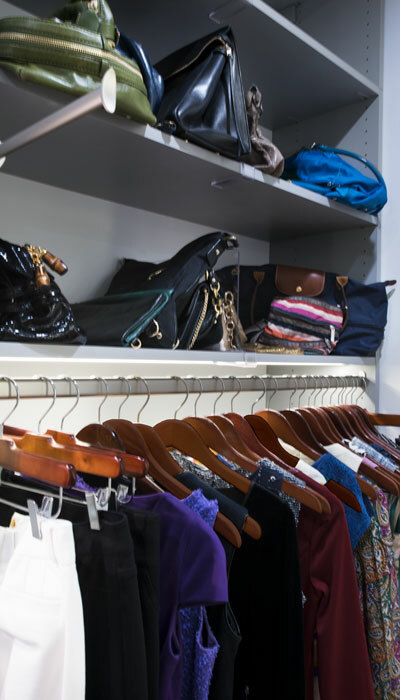 All rods and shelves are fully illuminated, making it easy to choose clothing and accessories without even having to turn on the overhead can lights. 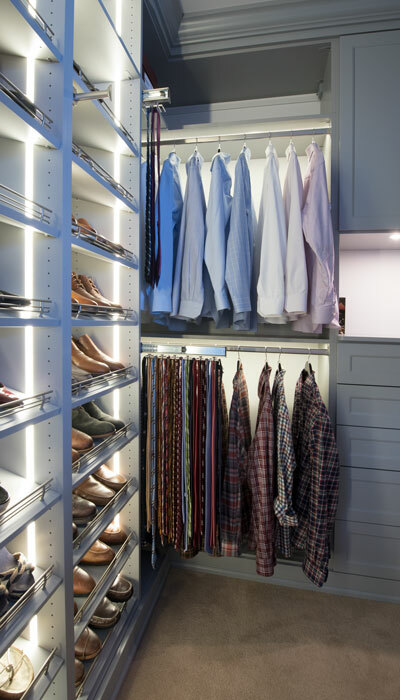 The closet can become a light show that is almost a work of art in its own right. The center of the custom closet systems includes a three sided island perfect for packing a suitcase. Corners on the laminate countertop were rounded to prevent injury in case the owners accidentally bump into it. A custom mirror framed by the same door panel style used elsewhere in the closet was hung above the suitcase staging area. Inside this island is a drawer and a tilt-out hamper. 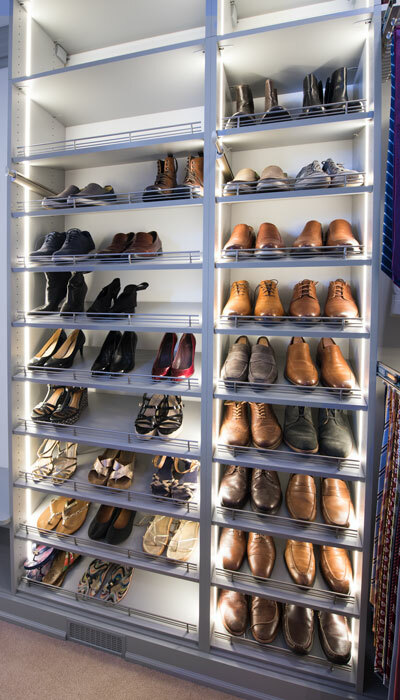 A floor to ceiling bank of shoe shelves line the wall closest to the door and are shared by the couple for their footwear. Slanted shoe shelves with shoe fences were used because the angle makes it easier to access the higher shelves. 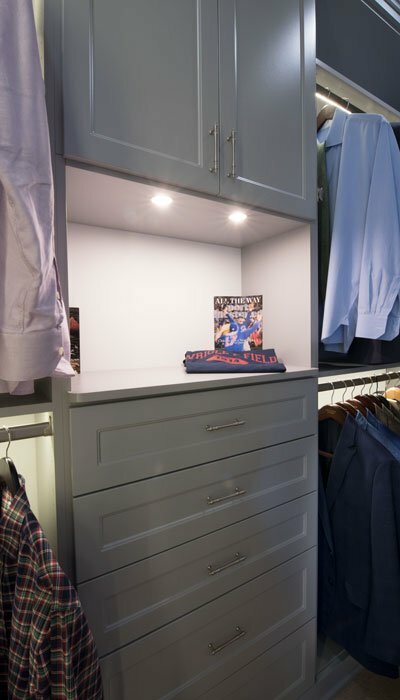 Both his and hers sides of the closet include a hutch unit with recessed, under-cabinet puck lights to illuminate the countertop where the couple organizes their papers and stage everything needed for the next day. 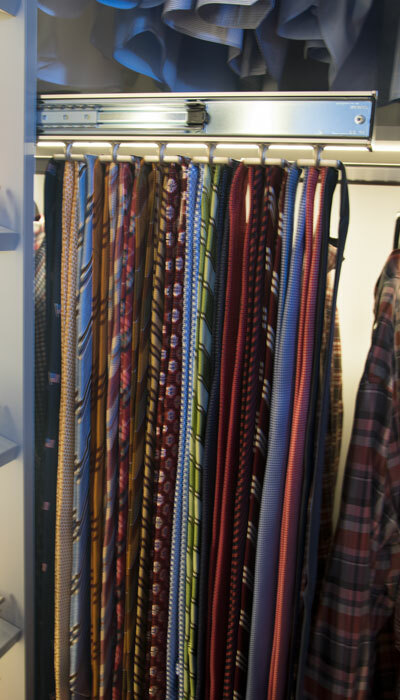 The ability to keep organized is one of the key benefits of having the new closet. 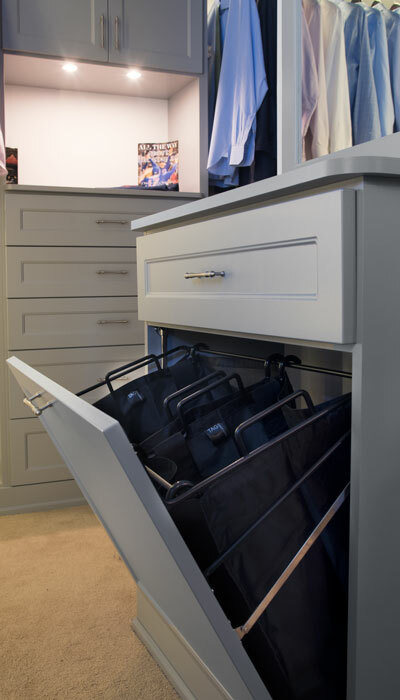 Both husband and wife have heir own bank of drawers for lingerie and personal items, plus a myriad of closet organizers like telescoping valet poles, scarf and tie rack. 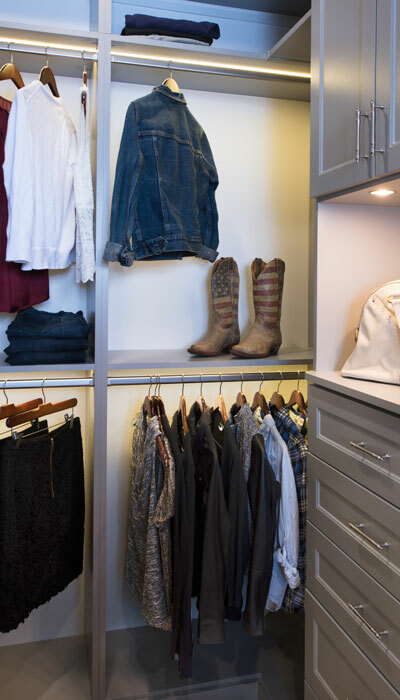 We provided a floor to ceiling custom closet systems so all space is usable. 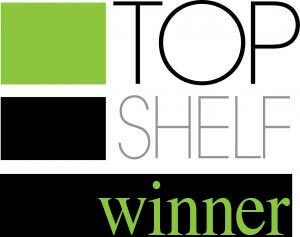 The center of the closet houses the chimney stack so there was no opportunity to change the shape of the space. There was an attic access that needed to be moved to allow the crown to terminate at the ceiling without impacting the crown moulding. The outlets were placed below the bottom shelf so that there would be easy access to the lighting transformers and power supply in case future maintenance was needed. We also used the crown and base moulding on the laminate custom closet systems to wrap the entire room. This was there was a continuity of base and crown within the room. There were also many accessories for staging clothing accessories such as valet poles, tie rack and belt holders. 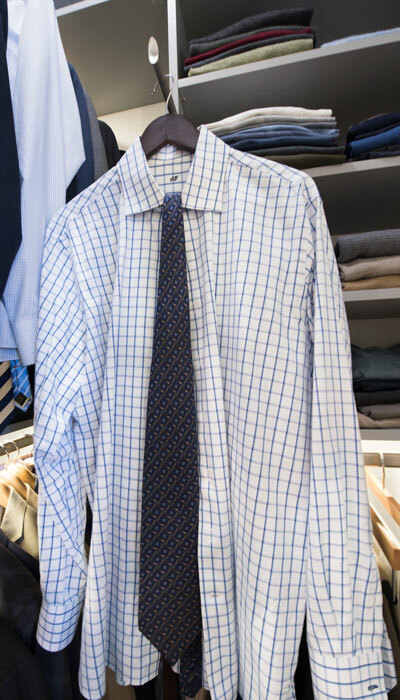 A mirror over the hamper and packing surface allows for one last check before you leave for a night on the town.